Varying your vocabulary is as important as varying your sentence length. It keeps readers interested and staves away boredom. Now, do you need to use a synonym every time? No, but it is beneficial to avoid using the same words in the same paragraphs. Why not find the perfect word? Isn’t that the beauty of writing? Finding the precise word to express your idea is part of the process. I realize that different genres call for different treatment of words such as “said.” My point is to know your genre. If you are writing for younger readers they may need more context clues. Sometimes it is helpful to know if a character is simply asking or if they are interrogating. It completely changes the tone of the scene. Here are a few more helpful lists of synonyms. 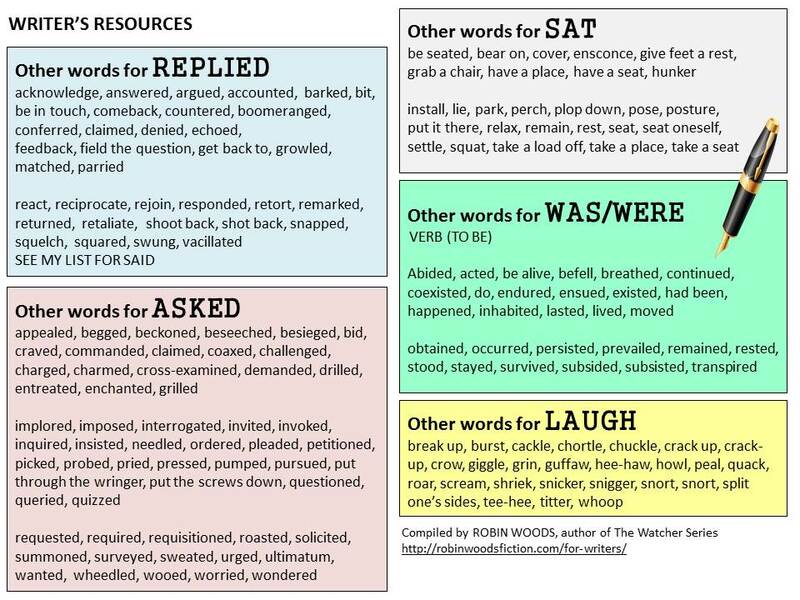 Printable PDF for personal use here: Other Words for Asked, Replied, Sat, Was, & Laugh. Check out the resources and master lists in the Prompt Me Series here on Amazon.